I'm using the new Affinity Photo for iPad. Very cool! How do I save a selection I've made for use in another project? Not sure I was clear with my question. I want to cut a part of one picture out, save it and use it in another project. Not sure how to do this on the iPad version. Create you selection as usual in the Selections Persona, then change to Photo Persona (on top), click the ellipsis icon (the three dots on top) then select Pasteboard ▸ Copy. 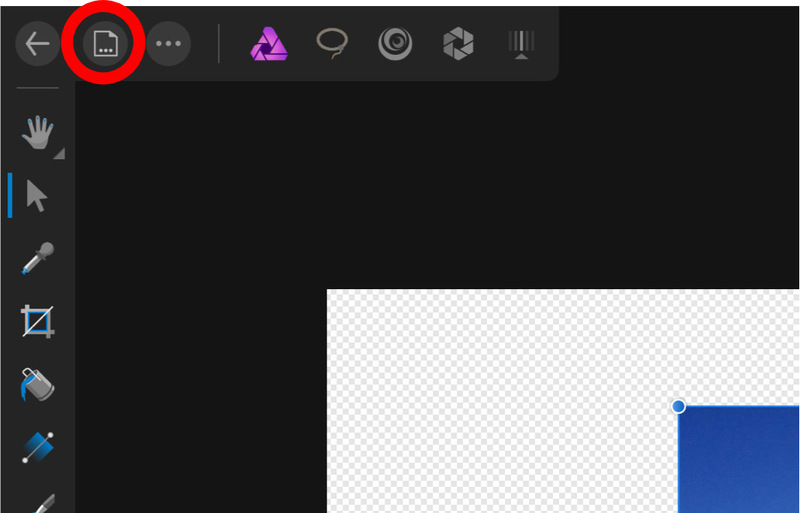 Go back to AffinityPhoto home screen, open the document where you want to paste it, then go to the ellipsis icon in Photo Persona again, Pasteboard ▸ Paste. It should paste your selection in the new document. This leads me to other questions. Where does photos save its files by default? Can I select a place in the cloud to be access by another program or in Photos on my pc? By default files (both afphoto and generic/exported formats) are saved/exported to your iCloud Drive (you can select to which folder or place them inside an app folder there) or other cloud service you may have installed on your iPad (Dropbox etc), so you can access them from the iCloud Drive folder (or other cloud service folder) on your Mac/PC. O.K., got it. Thank you! How does it save the files (.afphoto)? There is only a save as option. If it's by default how do you access them on Mac, I can't see the files I've created in Photo for iPad in iCloud anywhere? Sorry if I'm a little slow on the uptake, but now, how do I save that cut out image as it's own image to access at a later date? To save the file as an afphoto file, go to the document icon in Photo or Selections Personas (on top of the interface) and select Save A Copy. Then name the file and tap Save on the bottom, you will then be taken to the iCloud Drive screen to choose the folder where to save the file. You can also choose another cloud service tapping the Locations button on the top left of that screen (note that the Locations button only appears if you have other cloud services/apps installed on your iPad - like Dropbox and similar). For clarity, MEB, I create a new document by selecting "+" icon > new > OK. I then immediately select the Home icon (<-) in the upper left corner. The file is now shown on the Home page as Untitled. Where is this file saved? I don't see it in my cloud drive. Does it not save automatically? 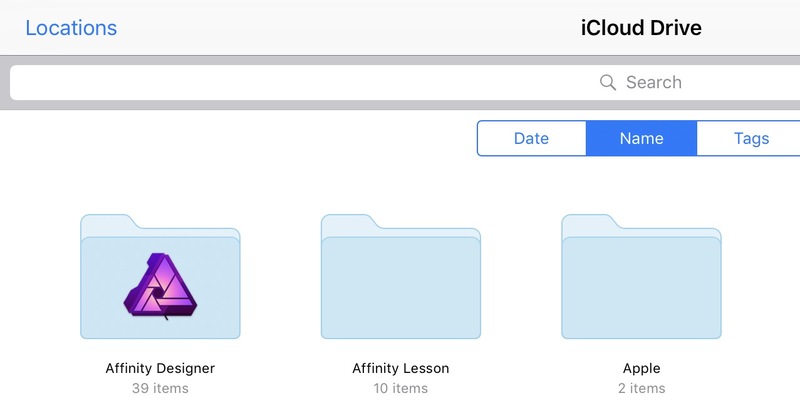 Plus there is no Affinity Photo folder on the iPad side of things in iCloud only on Mac. Also, the Affinity Designer folder has the Photo icon instead!!! And yes the option is on in Cloud Drive, interestingly the Affinity Photo Folder appears on Mac, well the beta folder did until I deleted the Beta version of Affinity photo. Sorry i should have been more clear. If you go back to the Home screen without doing anything else the file is automatically saved there. To delete or rename it, click the menu button on the bottom right of the thumbnail. Files "saved" here are not accessible from outside the app. The Save As Copy and Export options i was referring to are located in the document icon - the one on the right of the (<- ) when you have a document open -, see screenshot below. Currently there's no way to open a file from iCloud Drive (or other cloud service), edit it and save directly over it. We are aware of those workflow issues and will do our best to improve/solve them in the future. Sorry i should have been more clear. If you go back to the Home screen without doing anything else the file is automatically saved there. To delete or rename it, click the menu button on the bottom right of the thumbnail. Files "saved" here are not accessible from outside the app. The Save As Copy and Export options i was referring to are located in the document icon - the one on the right of the (<- ) when you have a document open -. Yes, you have to save a copy to a generic folder in iCloud Drive or other cloud service (thus duplicating the file) to access it from your Mac, unless i'm missing something. As i said we are aware of these issues. iOS 11 may also change a few things here so please bear with us while we work on this. This is the first iPad release, things should only get better from now on (hopefully). - create a new document on your Mac, then go to File ▸ Save As... and select Affinity Photo - iCloud from the Where dropdown (with the save dialog collapsed). This will force the creation of the Affinity Photo folder on iCloud. 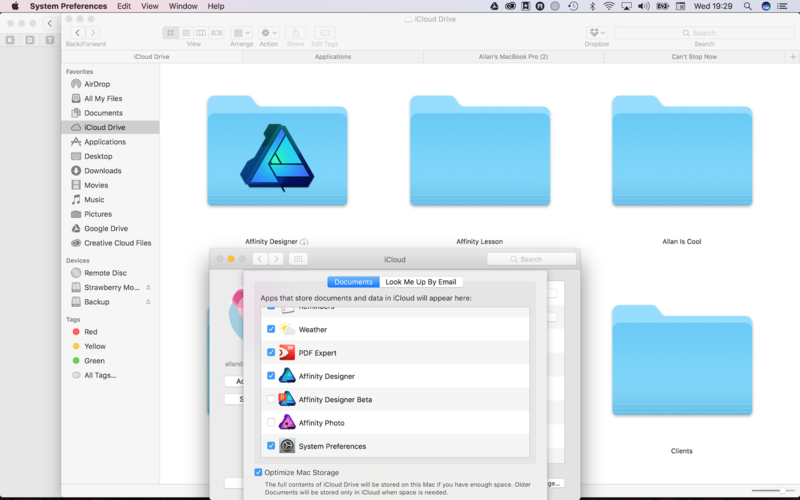 You should then be able to use the Affinity Photo iCloud folder when saving a copy or exporting from the iOS version. Let me know if it worked for you. Please check my reply above again as i've been editing it while you were replying regarding the Affinity Photo iCloud folder. Let me know if it worked for you. Seems it's working fine already. The folder is on the Mac in iCloud Drive, I just can't see it on the iPad,iPhone or Web. Any new folder I create does appear. Yes, the wrong icon issue also happens here. Regarding the folder not appearing on your idevices have you saved at least one file to the Affinity Photo iCloud folder on your Mac? You have to save at least once there for the folder to appear on iOS. In my iCloud options if I check/uncheck the Affinity Photo folder it controls both Affinity Photo and Designer folders. If I uncheck Affinity Photo the check box for Affinity Designer works as it should. interestingly the icon is correct on iPhone and the web just not the iPad.